If you read my first post about starting to read the Bible rapidly, you might remember that my goal was to finish in less than five months. So I accomplished my speed goal. I also accomplished much more than that. I realized through reading the whole book quickly that Keith Ferrin was right. The Bible is a book written for the sole purpose of the reader falling in love with the Author. Not the human authors who got their writing orders from above. The divine Author who guided them and their quills. Reading the Bible in a short time period made me realize that it is not a manual to take out whenever life breaks down. It is a love letter that we want to read over and over again. A love letter from the Creator of the universe to all of His creation. I also realized that the Bible is just one big story. It has a beginning, which even starts, “In the beginning.” And it has an ending. A huge climactic cinematic blockbuster ending. Full of mayhem and all the stuff even Hollywood could not invent. Like all stories, it also has a finish after the finish. And of course, there are lots of twists and turns throughout the middle of the book. Somehow, the Author keeps the story and themes cohesive. Which is something I knew, but never realized until I read the whole thing like one big book. When I stopped reading it like a manual. 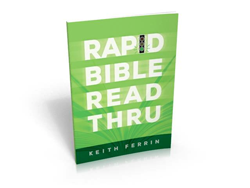 I would encourage anybody, the curios who just want to know what the best seller of all time is really all about, the skeptical who want to find inconsistencies and mistakes, the believers who want to know God deeper, to read the Bible rapidly. Read it like one big story. You can even read it chronologically with a little help or with a chronological Bible. I just encourage you to read it in big chunks of time. Like you would any book. Just read. I do have one caution though. It is the same caution I gave to a former student years ago. When you read the Bible, especially if you read it rapidly in big chunks of time and read it with an open heart, be ready to be changed. After all, it is a love letter written by the Creator of the universe to each individual person who has ever walked or will ever walk the earth. And that unrelenting love shines through. I will continue to read my Bible quickly each year. It is certainly a great way to get the whole story. And even though I am not that much of a braggart, I can at least brag a little. After all, I finished reading the Bible in just four and a half months.